MoviePass has gone insane. That’s the only conclusion to draw from the company lowering its prices to just $9.95-per-month. For that small outlay you can watch one movie a day at a theater near you, with few restrictions. See, I told you MoviePass was two sandwiches short of a picnic. A trip to the movies used to be relatively cheap. Now, when you add up the price of the tickets, plus drinks and snacks for all of the family, you’re talking about the GDP of a small country. It’s no wonder fewer people now bother going, especially when Netflix is such a bargain Why You Should Be Happy to Pay More for Netflix Why You Should Be Happy to Pay More for Netflix Every time Netflix increases its prices, millions of binge-watching users balk at the prospect of paying a couple of dollars more. But this is dumb, because Netflix is an absolute steal. Read More . MoviePass is now offering unlimited movies in theaters for $9.95-per-month. The only restrictions are that you’re limited to one film every day, and 3D and IMAX movies are off the menu entirely. But beyond that it’s anything goes. Which sounds too good to be true, to be honest. How it works is that you pay MoviePass $9.95 every month via a debit card. You then visit your local movie theater as usual, but MoviePass will pay for your ticket. If you go once a month you’ll just about break even, but if you go more often than that you’ll be saving some serious cash. This could be a win-win for everyone involved. However, according to Variety, AMC is already trying to prevent MoviePass subscriptions from being used at its theaters. The chain claims the pricing makes this an unsustainable model which will harm the movie business in the long run. It remains to be seen how long MoviePass can keep offering such a sweet deal, how many theaters will kick up a stink, and what, if anything, is the catch. But for now this seems like an attempt to force both the chains and consumers to start thinking differently about going to the movies Cinema Is Dying: How Movie Theaters Can Ensure Their Survival Cinema Is Dying: How Movie Theaters Can Ensure Their Survival Movie theaters need to offer more than just a way of watching the latest films. They need to stop competing on "convenience" and start focusing on "experience." Here's how. Read More . Do you still go to the movies? Do you begrudge the prices these days? Would you go to see more movies if it was cheaper to do so? 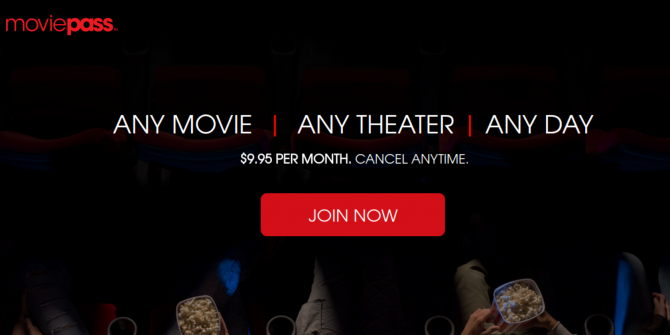 What do you think of MoviePass’ new subscription plan? Will you be signing up for $9.95-per-month? The comments are open below.